Gold in the Hills (with FOUR gears!) 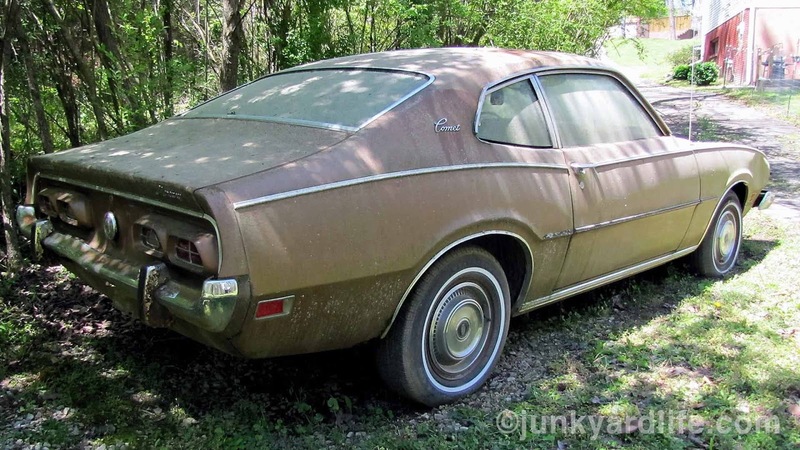 We have a barn find project that we call "the Prospector." However, Junkyard Life staffer Keith Lively really is a prospector. 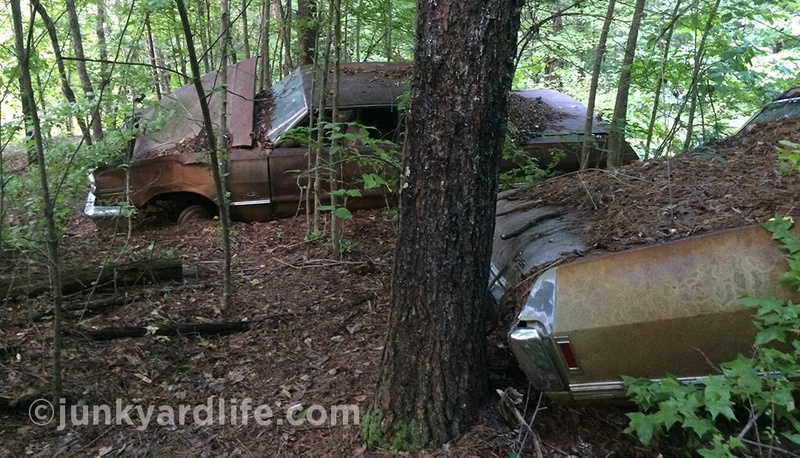 He found a host of seemingly forgotten Chevrolets in the deep woods of Alabama. With his trusty blue oxen (a homebuilt Jeep named “Money Burner”), Keith “Paul Bunyan” Lively began extracting the vehicles from the forest. Everyone scored on this Bowtie find, but Keith brought home the gold! It wasn’t easy. Our rusty gold rescue team had to spend a few days in the woods clearing trees to gain access to the cars and create an exit trail to haul them out. 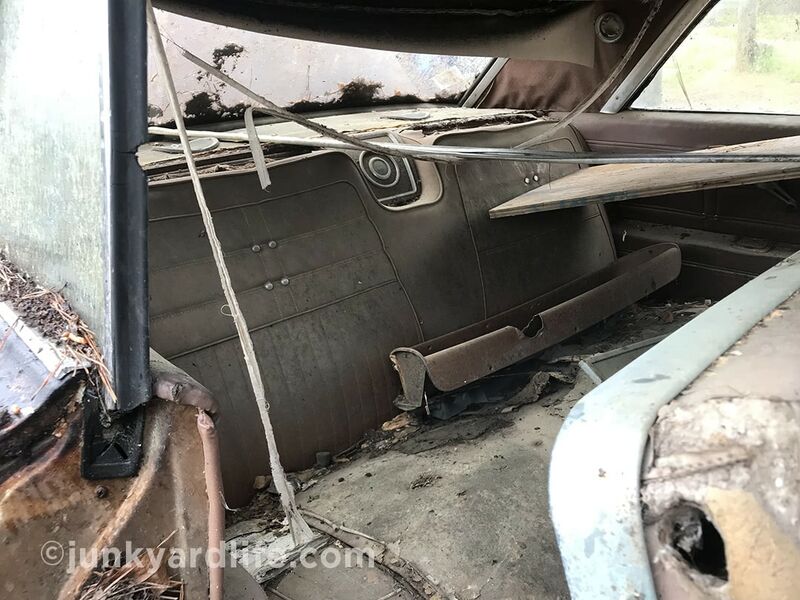 Factory 4-speed Impala SS console still rests between the buckets seats. 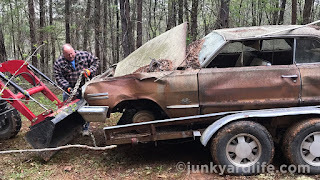 The last and coolest car we dug up and dragged out of the woods was (hold on to your pick axes, fellow automotive prospectors) a 1963 Impala Super Sport! Now that the lumberjacking was done, we still couldn’t get it out. Unless, we had a monster truck and a four-wheel-drive tractor. We just happen to have those! 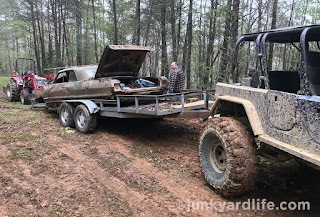 I (Ron) drove Keith’s LS-powered, blue oxen “Money Burner” Jeep pulling a trailer and Keith trudged his way in with a tractor. Truly, nothing else could have done it. Jody pitched in, by pulling, pushing and waving directions while filming the whole spectacle (stay tuned for video). 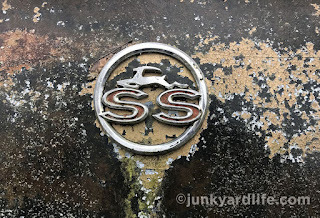 Weathered paint around the SS emblem is a thing of beauty. 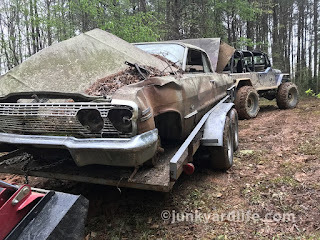 The Junkyard Life Extraction Team does it again! It was a true SS with bucket seats and a 4-speed. Score! It took Keith a couple of years of occasional checking in with the property owner to get hold of this gaggle of Chevrolet goodness, but bless his heart — he did it. 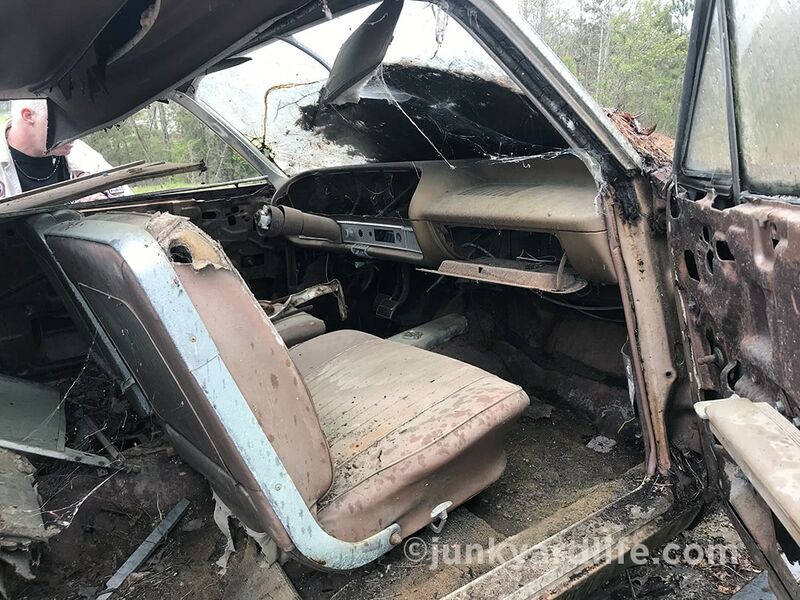 The Impala has so many great parts and even a spare set of bucket seats in the trunk. Unfortunately, the 327-V8 and 4-speed are gone, but it was as if they were removed and the car just pushed to the side. What? 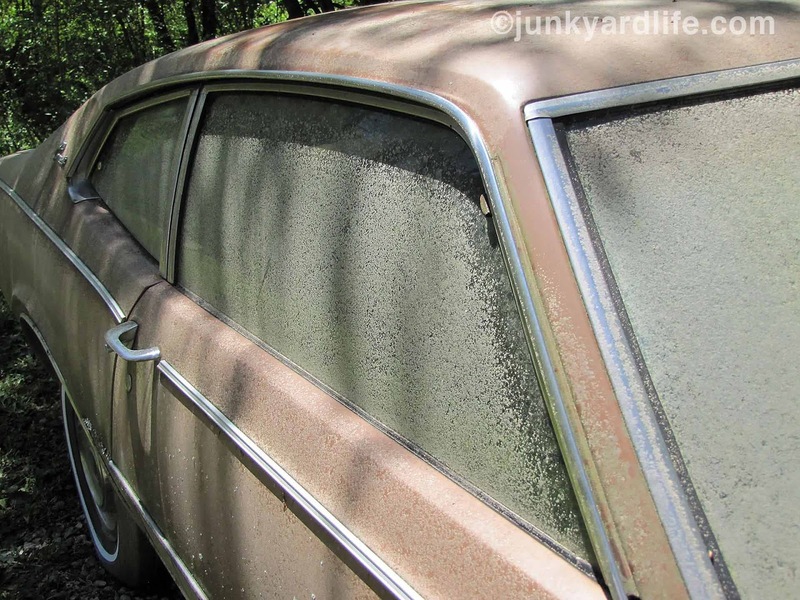 Who could have committed such a crime against vintage car humanity? 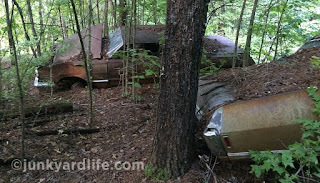 This is how the ’63 Impala looked, among trees and several other abandoned Chevys. 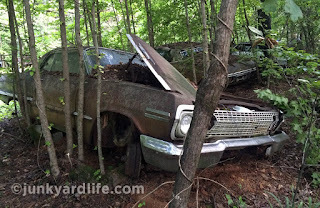 That’s a 1968 Impala coupe in foreground. You know how as of late everyone wants to put an LS based power plant in everything with wheels short of their lawn mowers? Well, in the 1960’s and early 1970’s Chevrolet’s 327 c.i.d. was the hot power ticket. Street racers, track racers, street machines and anyone with an ego and a small block wanted the 327. The former owner of our Chevy garden was no different. 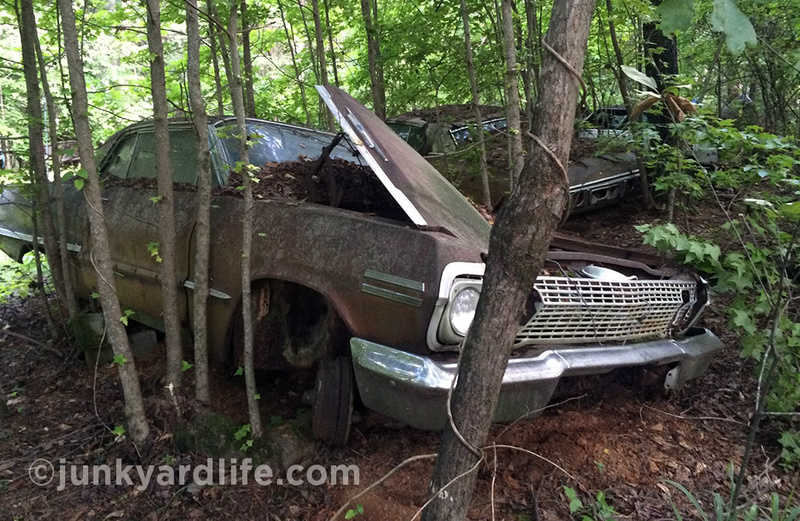 By the time we found our third full-size Chevy in the woods, we sensed a pattern. Sometimes things are what they seem and it seemed someone targeted full-size Chevys packing 327’s, removed their power plants and discarded the cars. The 1963 Impala SS spent the last 40 years in the woods until the Junkyard Life team, led by Keith Lively, haul it out. So the land owner snagged the 327s. What we don’t know is where they went or even what kind of Chevy he was racing or just running back and forth to work. Thirty-or-more years later, we got what was left. That sounds like something we would do, doesn’t it? 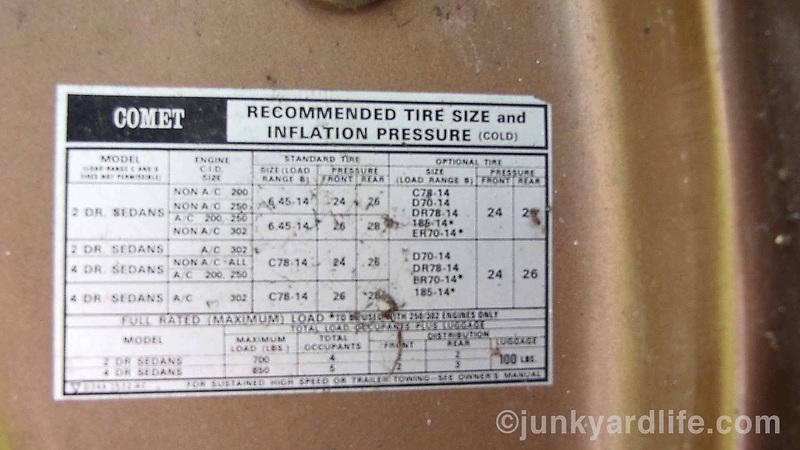 Paint code 932 listed on trim tag of the 1963 Impala SS. If you can’t imagine how cool this 1963 Super Sport is, try to imagine what it was — a very stunningly beautiful and infinitely fun car. Code 932 paint and code 858 trim comes back to be Saddle Tan with Saddle interior. 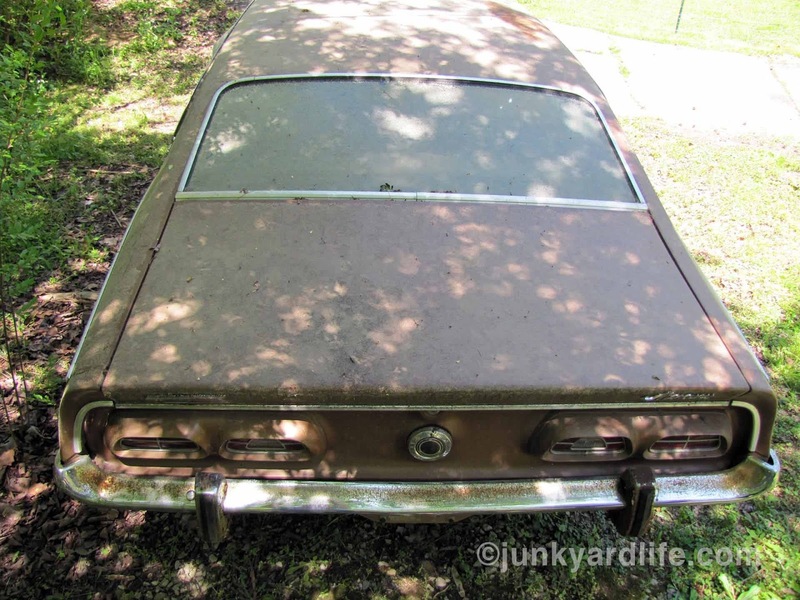 Although the Impala appears to be code 920 Autumn Gold, either way a very handsome appearance. It was not loaded with options. The original buyer checked off all the fast things his budget allowed. We know he could have gone faster, but that was expensive. This was a nice car. So he opted for the 4-speed and 327 combo. 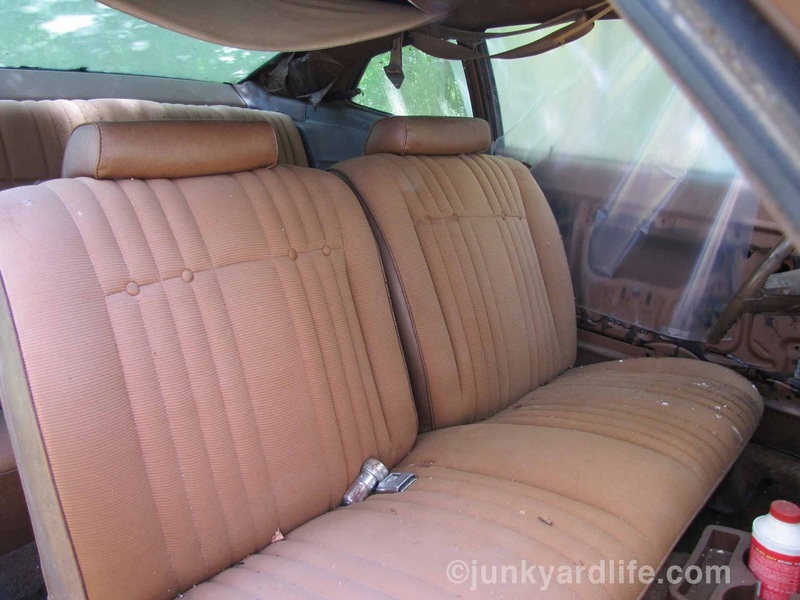 No air conditioning or power things, just self shifting fun in the upper level Impala body with Super Sport trim. You would have to spend some money to outrun it. Just ask the Biscayne guys who ran Super Stock at the time. 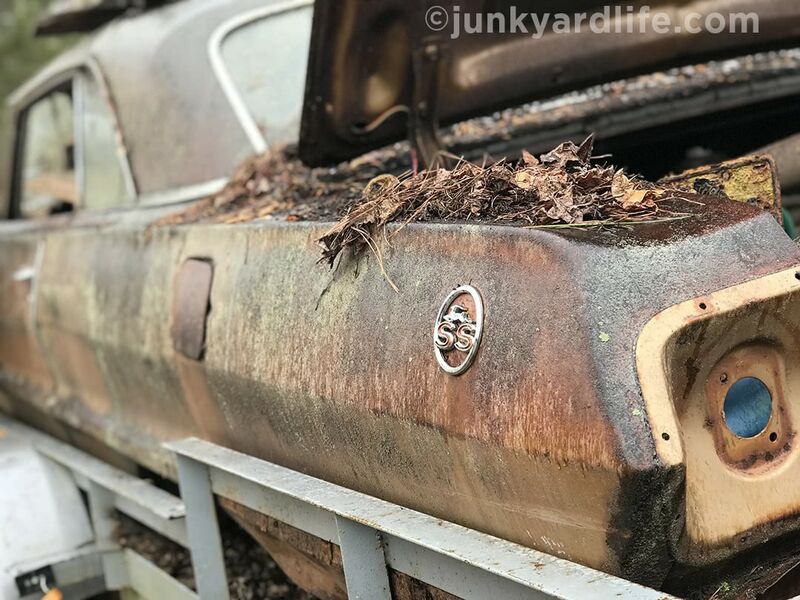 Loaded on the trailer, the Impala moves for the first time in decades. 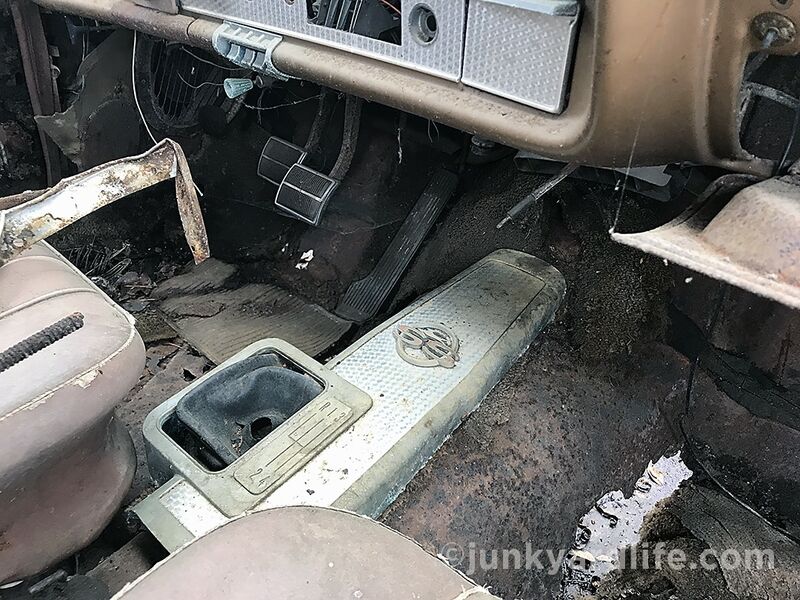 All is well that ends well, that is, us getting a 1963 Impala with three pedals. 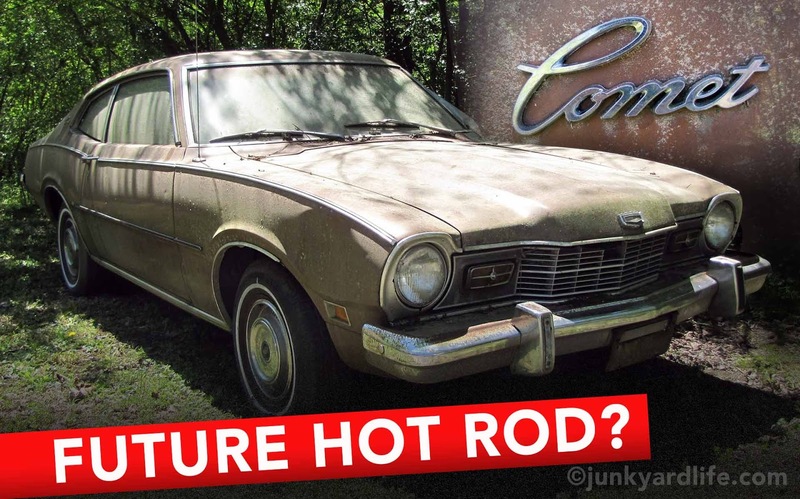 But, will this be the end of the road for this golden beauty? Absolutely not! 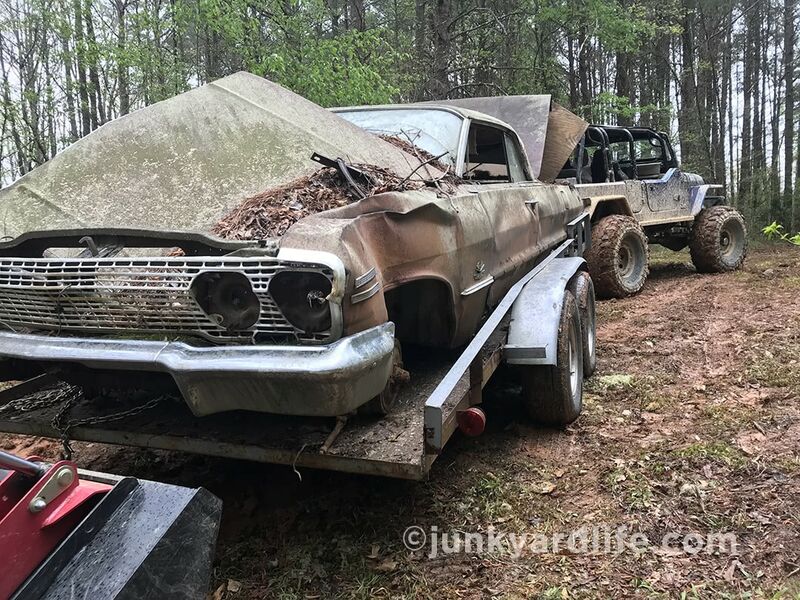 If Keith does not keep it for himself (he is our Impala expert at Junkyard Life) we will find it a good home that insures us that someone will be chirping the daylights out of second gear! Jody Potter, left, and Keith Lively study the situation before they move the trailer under the rear of the ’63 Impala. 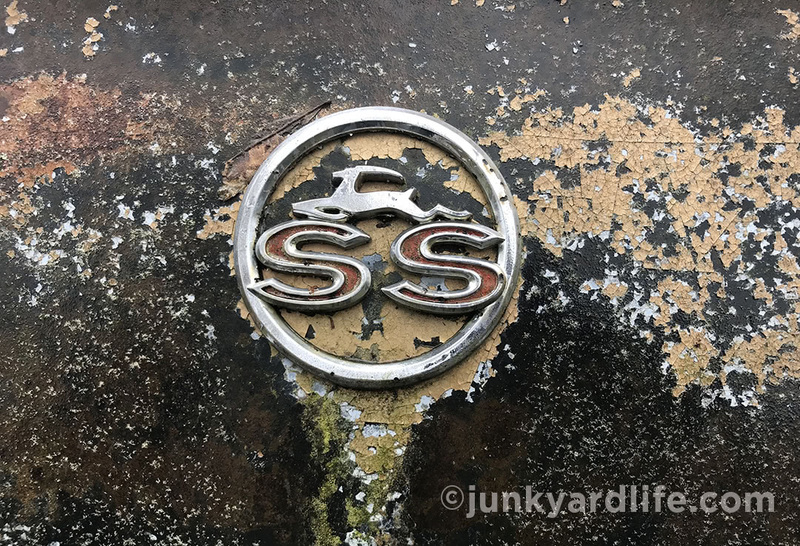 When we first set eyes on the ’63 SS, our hearts stopped when we saw the fender emblem — from 20-feet away it looked like a 409. 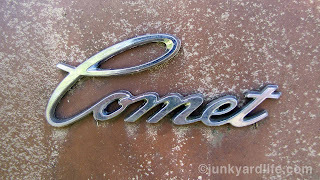 Aforementioned emblem actually was a 300 emblem (1964 Chevelle issue) that did not belong on the car. 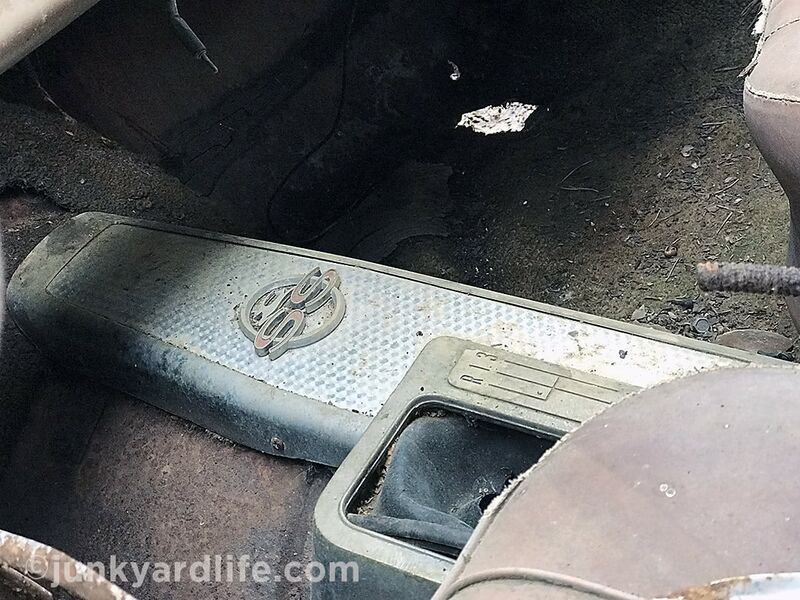 Junkyard Life staffer Ron Kidd spent an hour researching before determining the emblem was incorrect. 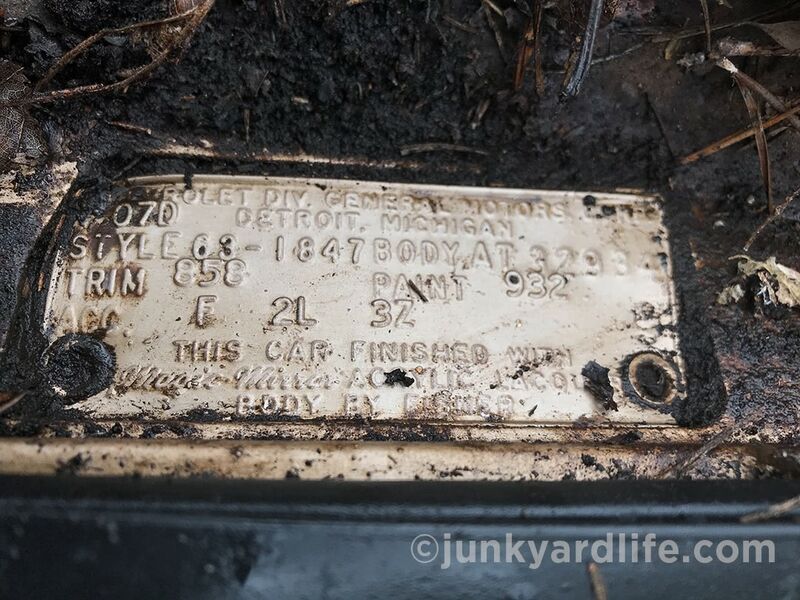 We thought for a minute that the car was a 50 year anniversary Impala built in Anniversary Gold code 927. However, we were off by a year. That was done in 1962. 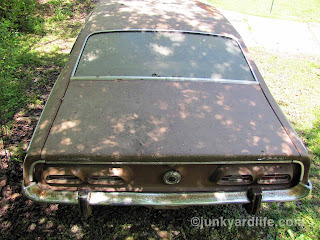 None of us here at Junkyard Life are sure it is not a re-paint in that very color. 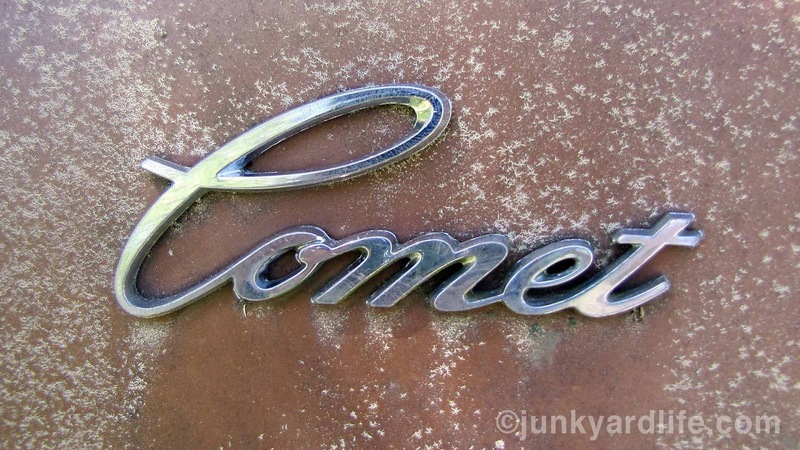 We’ve read that only 300 or so of the anniversary cars were built, which made Ron wonder about the validity of his conclusion, thus more research on that darn emblem. Jody and Keith told him that from the beginning. The 50 Millionth car built by GM was a gold 1955 Bel-Air. Thus, at the time people were confused when they again celebrated a 50th in 1962. This time it was years and not number of cars built. Smokey Yunick was loaned a 409 Impala in 1963 and didn’t like it. 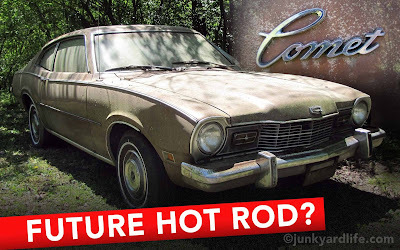 Chevrolet engineers cold shouldered him for a year after all the bad press. The Beach Boys loved the 409 Impala and wrote a song about it. One of the Wilson brothers owned one and was known to engage in red light battles. The full-size Chevrolet line was using a new modern frame, known as the X-Frame. It was to provide more rigidity and strength. Crash tests indicated that the frame didn’t work as well during side impact collisions. 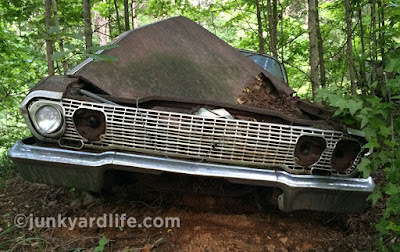 When you find a classic car in the woods what do you do? 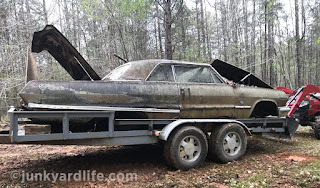 If it is a 1963 Impala SS we bring it home — with permission of course. Detail from driver’s seat of the 1963 Impala SS 4-speed console with bright swirled trim details. 1963 Impala SS 4-speed interior holds buckets seats. Saddle interior holding up on most of the interior including rear seats. 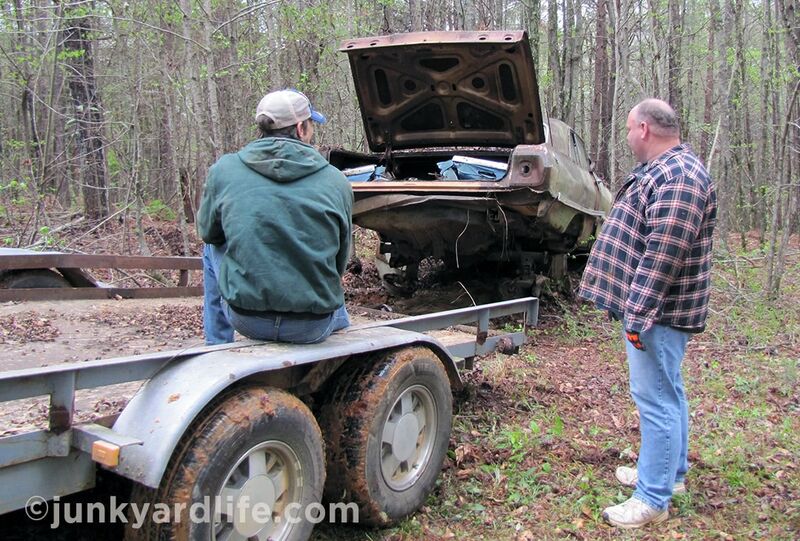 A tractor was needed to lift the front end of the ’63 Impala SS to better ease it onto the trailer. 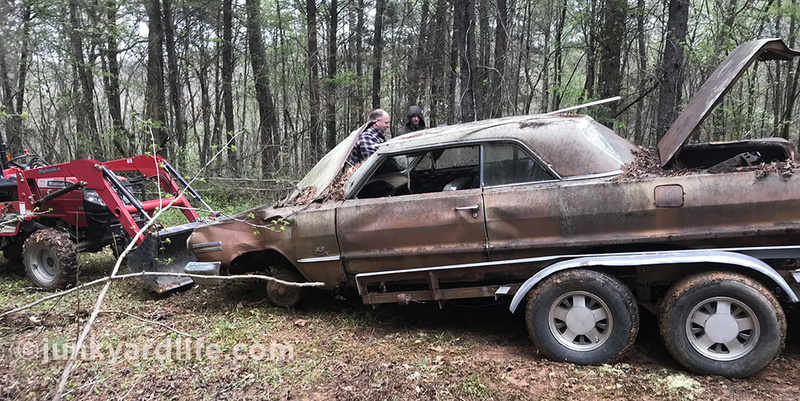 Keith Lively used chains, tractors and his monster Jeep, “Money Burner,” to yank the Impala SS out of the woods. 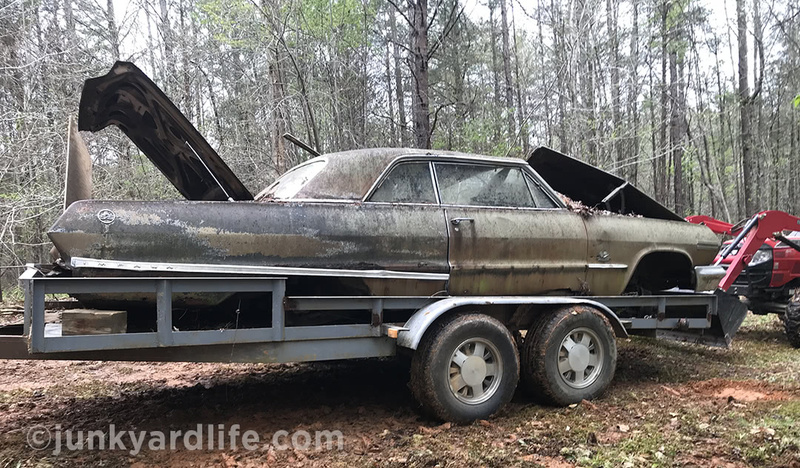 Loaded up ’63 Impala SS is ready to move. Shiny Gold or Saddle Tan paint visible on area once shielded by the tail light panel on the ’63 Impala SS. 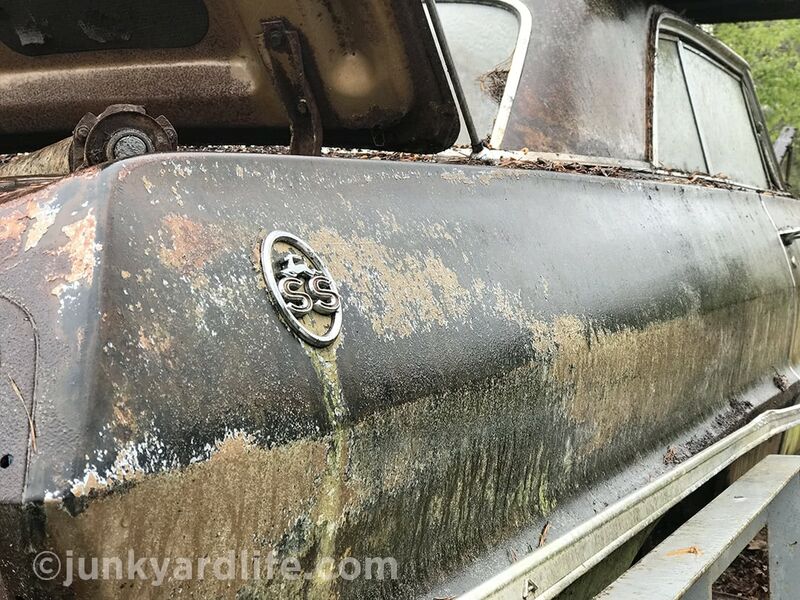 Quarter panels look surprisingly good on the abandoned ’63 Impala SS. 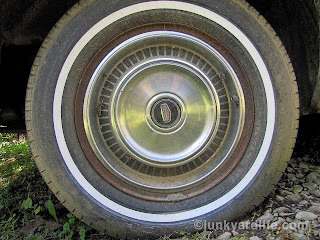 The damaged fender is only body damage on the ’63 Impala SS and was likely the cause of its demise. 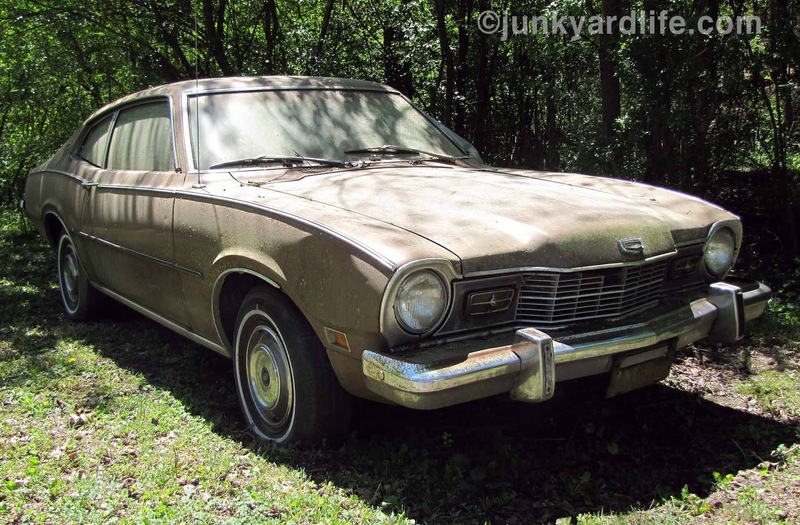 Back in the 1970s, older cars did not have much value once wrecked. 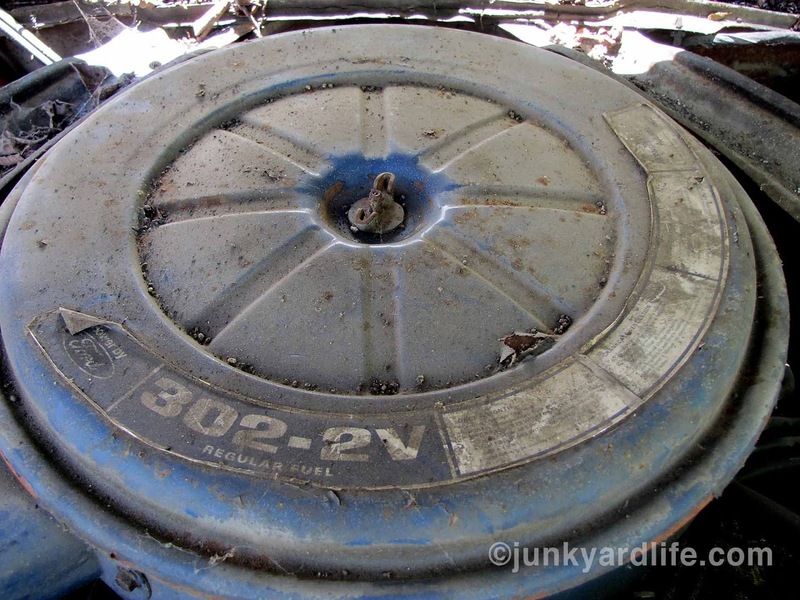 This one was basically scrapped out for the 327 engine. 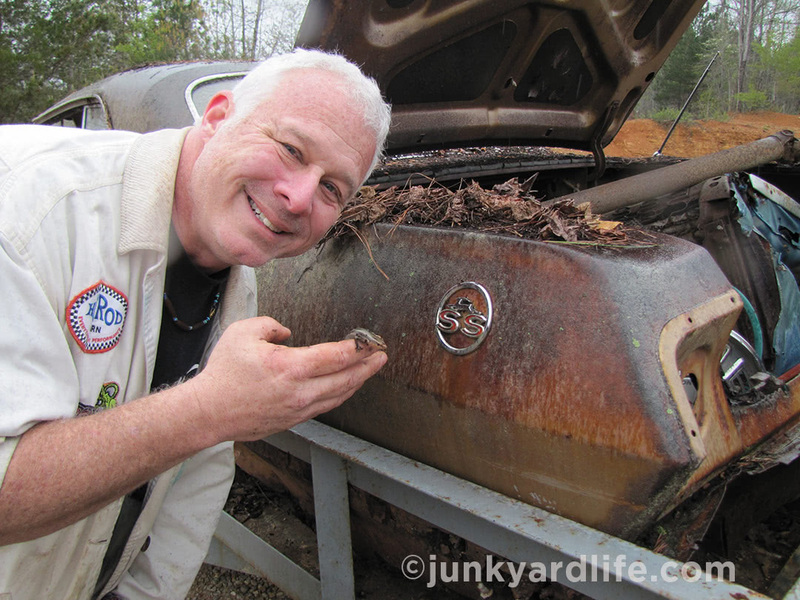 Ron Kidd holds a wiggly reptile that he found living under wet piles of leaves in the ’63 Impala’s trunk.